Apollo 10 was the fourth manned mission in the American Apollo space program. It was an F type mission—its purpose was to be a "dry run" for the Apollo 11 mission, testing all of the procedures and components of a Moon landing without actually landing on the Moon itself. The mission included the second crew to orbit the Moon and an all-up test of the lunar module (LM) in lunar orbit. The LM came to within 8.4 mi (13.5 km) of the lunar surface during practice maneuvers. According to the 2002 Guinness World Records, Apollo 10 set the record for the highest speed attained by a manned vehicle at 39,897 km/h (11.08 km/s or 24,791 mph) during the return from the Moon on May 26, 1969. Due to the use of their names as call signs, the Peanuts characters Charlie Brown and Snoopy became semi-official mascots for the mission. Peanuts creator Charles Schulz also drew some special mission-related artwork for NASA. Continuing with their real-space releases, Dragon has done the upper portion of the full Saturn V stack. This not only includes the Command Module, but also the Lunar Module and the Launch Escape System. The kit is quite similar to the earlier Apollo 11 kits in terms of the command module and the lunar module, but uses the folded legs on the LM. The kit also does not have the deployed antennas that were used on the previous command module kits. What is new to this boxing is the clear lunar module cover, (thou gh I suppose you could paint it if you wished) and the launch escape system. This fits atop the command module. Unlike the Mercury escape tower, this one is four sided so should be a lot easier to assemble and paint. Builders may want to consider not gluing this assembly in place as it completely covers the command module. Those who do can save some build time and painting by not adding the detail bits to the top of the command module. Instructions are well drawn and all color and markings placement information is on the bottom of the box. As usual, Gunze paint references are given and the small decal sheet is well printed. 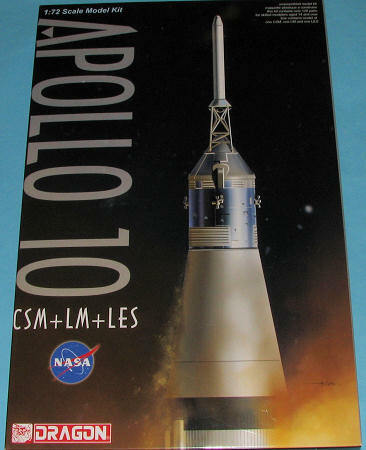 If you want a pretty complete Apollo set and cannot afford the $250+ for the Saturn V stack, then this is a kit you really should add to your collection. This will go great with the other kits in this series thanks to Dragon's sticking with the same scale with all of them. 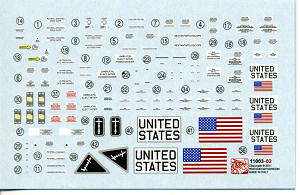 Thanks to www.dragonmodelsusa.com for the preview kit. Get yours today at your local hobby shop.